Commodity trading apps, like any other utility apps, are super crucial for traders who prefer trading in the Commodity segment. And there are way too many things, a commodity trader looks for in a specialized trading app. But before we jump into naming the top commodity trading apps and the reasons/stats behind those choices, let’s understand some of the basics, especially for beginner level traders. If you are a relatively advanced trader, you may choose to skip a few paragraphs! Commodity Trading is an age-old profession. Our ancestors also indulged in the trading of commodities, although in an entirely different way as compared to today. In the past, commodities like oil, metals, spices, grains etc. were all traded but the trade was mostly in the physical form. The commodities were actually delivered from one party to the other and payments were made. However, in today’s time of modern technology, commodity trading has taken a completely different face altogether. In the present day terms, commodity trading includes trading the commodities like metals, energy, grains etc. on the trading exchanges. There are many dedicated commodity trading exchanges like Multi Commodity Exchange (MCX), National Commodity and Derivatives Exchange (NCDEX), London Metal Exchange and many more. Commodity trading, like all other forms of trading, is also a complicated phenomenon which requires a lot of skills and experience. The commodity traders must be very knowledgeable of world events and news, and all the factors that affect the prices of commodities. This is because commodity trading is based on the principle of supply and demand, and supply and demand are largely affected by economies, technological advancements and the overall composition of the world market. The trader needs to stay abreast with every news and must be disciplined enough to remain in front of his computer for the entire trade. With the further advancement of technology, however, a number of commodity trading apps have been developed by the financial institutions and brokers. These apps enable the traders to be able to keep a track of the entire commodities market, prices, orders and positions right from their mobile phones, and almost all transactions are possible using these apps. Commodity Beat is one of the most innovative commodity trading apps which is designed specifically for the commodities market, including precious metals. It allows the tracking of movement of the commodities market and provides tick-by-tick data to the users. It also provides coverage of the Bullion market, including news and analysis by the experts. The most important strength of the app is to provide data real-time, with very low latency, from both domestic and international markets. 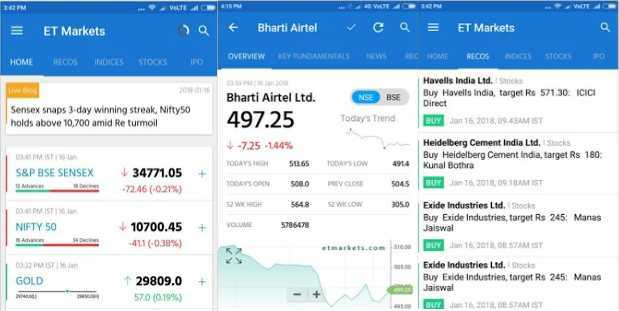 The app is very easy to use and provides fast and accurate data including intraday charts, ticker news and articles, economic data, parity/disparity calculator, pre-open market view and research call or notification by a third party. 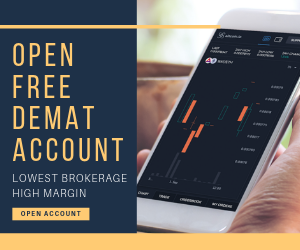 The live data provided covers data from domestic equity and commodity index like NIFTY, SENSEX and MCXCOMDEX, international precious metal data, gold and silver data from MCX, forex spot and domestic spot market rates by banks. ET Markets is one of the excellent commodity trading apps, with state-of-the-art features and technology. It provides updated and real-time information about the stocks, commodities, mutual funds etc. on the major exchanges and uses smart voice search to find news and views on the financial instruments. The most unique feature of the app is that it is available in 8 regional languages along with English and all the market indicators can be tracked in all these languages. A portfolio can easily be built, viewed, modified and accessed, along with customisation in terms of news, alerts, data and analysis. 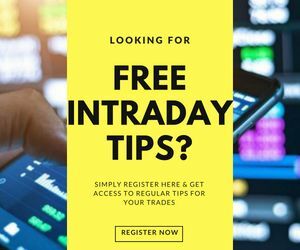 The app also provides regular free tips on commodity trading and other forms of trading and the information can easily be shared on social media. ET Markets also offers technical analysis tools in the form of live interactive charts in multiple types and also offers the offline reading facility. 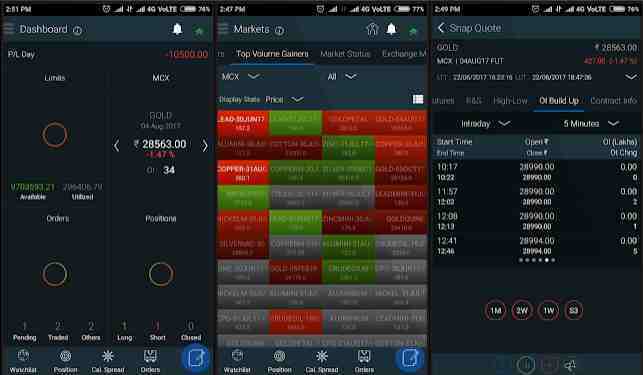 Edelweiss offers one of the most useful commodity trading apps for android. It is a convenient, easy to use app that combines all the necessary features. 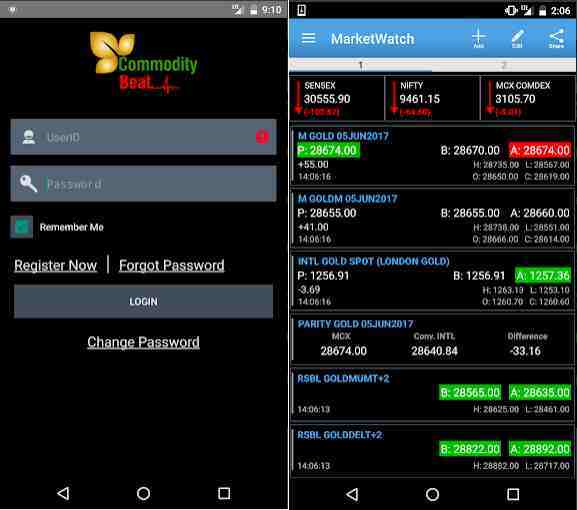 The app has a MarketWatch syncing feature which saves the list of commodities and stocks that the investor created on other platforms like Xtreme Trader. It also lets the trader get quotes for all the commodities listed on MCX and NCDEX. There is a separate screen for contract details that contains all the details of the contracts along with market depth and intraday charts with technical indicators. New contracts can be added to this list and can be traded on the same screen. The chart type can also be selected according to the requirements as to area, line, candlestick or OHLC. The market depth includes ‘top 5 bid and asks’ along with numbers of orders and sizes. The most characteristic feature of the app is that the funds can be directly and securely transferred from the trader’s bank account to the commodities trading account and back, as required. The finances are also visible in the app, including the account balance, margin used, limit available etc. It is a comprehensive app that can directly be used to place orders, view order status, view the day and net positions and to square off the positions straight away from the mobile. Moneycontrol is one of the best commodity trading apps, particularly in Asia. It provides all the information about the Indian and global financial markets on the go. The data includes updates about the stocks, futures, options, mutual funds, currencies and commodities and major exchanges like NSE, BSE, MCX and NCDEX are covered. The most important feature of this one of the top Commodity Trading Apps is its ease of use. 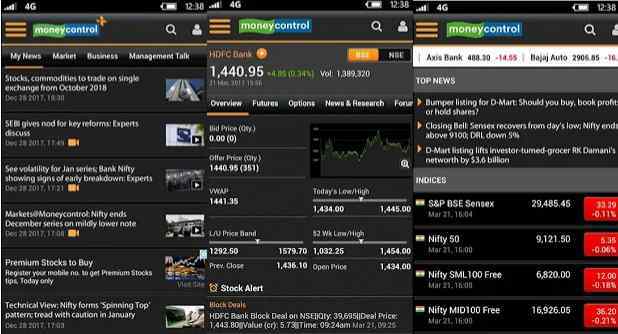 The app provides a search bar for all stocks, commodities, news etc. and the entire portfolio, watchlist and financial data can be accessed easily. Moneycontrol provides extensive news, analysis and expert’s views about the financial markets and the price data from the exchanges is latest and updated. The app also provides technical analysis using charts of line, area, candlestick and OHLC types. Moneycontrol helps to monitor the entire portfolio of the trader across all financial instruments and also helps in creating a watchlist to which the favourite stocks and commodities can be added and alerts are received for the same. A paid version of the app is also available that gives added benefits of ad-free experience, personalised news updates, alerts and faster refresh rate to get the most updated quotes in the fastest time. 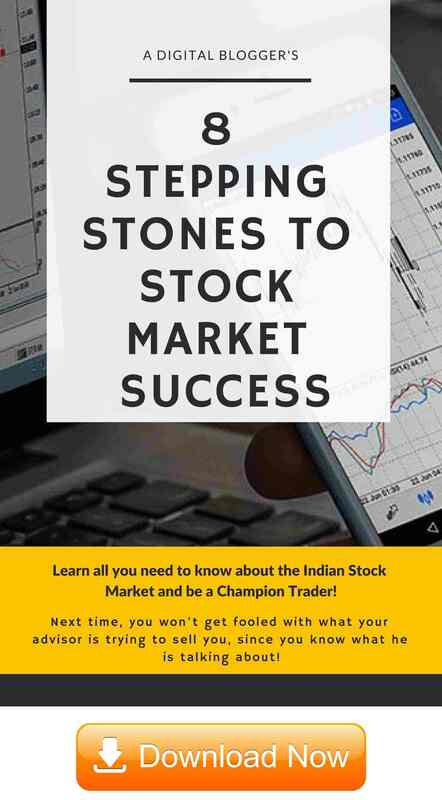 IIFL Markets is one of the most downloaded and highest rated commodity trading apps, especially in India. The app provides a holistic trading approach wherein everything can be done using the app including placing orders and squaring off positions. It has excellent tools like Ideas, Live TV, MarketWatch and others to keep the trader updated with the market every minute and features like Buzz that provides the latest developments and updates in the market. IIFL Markets is a comprehensive and powerful mobile trading platform which enables instant trading not only to the broking customers of IIFL but also to guest users. The app offers personalised watchlist which can be segregated into different segments like options, futures, commodities etc. and price alerts. IIFL Markets also offers a unique feature called IIFL View that helps the traders to get expert’s views on any financial instrument just with the swipe of a finger. The app provides almost everything that a trader would require to deal with the trading market including livestock prices, in-depth analysis and tools for analysis. 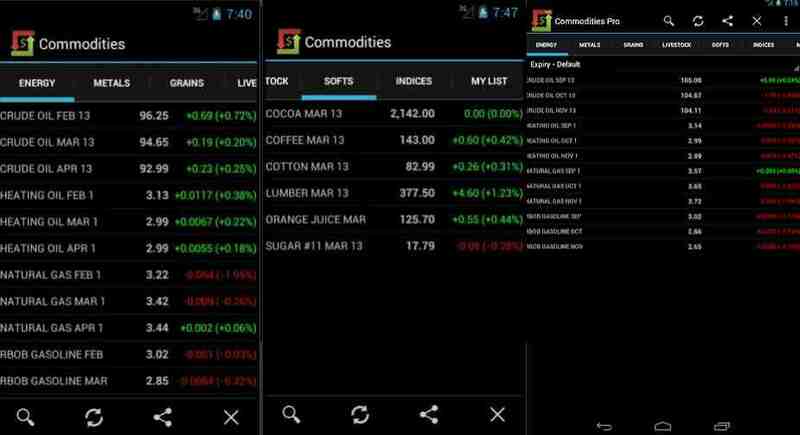 The app also gives full-fledged access to the markets like NSE, BSE, and the commodity and currency markets. Reliance also offers a similar app which is one of the most comprehensive commodity trading apps. The Reliance Commodities Trading App offers the features that make trading possible on the go. The trader can do almost everything from the mobile in the palm of their hands. It has live streaming of Market Watch and live commodities quotes. The watchlist can be customised according to the choice of the trader and real-time charts are available from MCX and NCDEX. The orders can be directly placed from the app and can be tracked real-time from anywhere. All types of orders can be placed including the Good till date and Good till cancel orders. The app also allows live tracking of the trader’s day wise and net wise positions and the positions can also be squared off using the app. 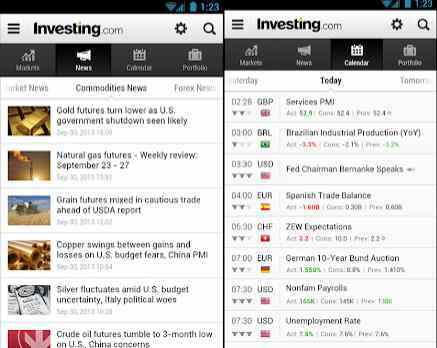 Investing.com is one of the most efficient commodity trading apps. It is used by millions of users to stay on top of their game. The unique feature of the app is to provide an economic calendar that gives updates on global economic events that might affect the price of the commodities and other financial instruments, customised according to the user’s needs. By using the calendar, the traders are able to track the major market-moving events and their impact on the market. Investing.com also provides real-time data for over 100,000 financial instruments which are being traded on over 70 global exchanges, along with a personalised portfolio with a customised watchlist for specific commodities and an effective alert system that can again be customised for a specific instrument, event or news. The app also offers tools for financial analysis and the analysis of the market and news by experts in the field, be it stocks, forex, commodities or the global economy on the whole. Angel Broking is one of the most innovative commodity trading apps to stay updated with the markets and to get forward-looking financial advice. The app is powered by ARQ, which is a high-tech auto advisory engine. The engine gives personalised advisory offerings, along with a smart trading platform that makes trading simple and quick. 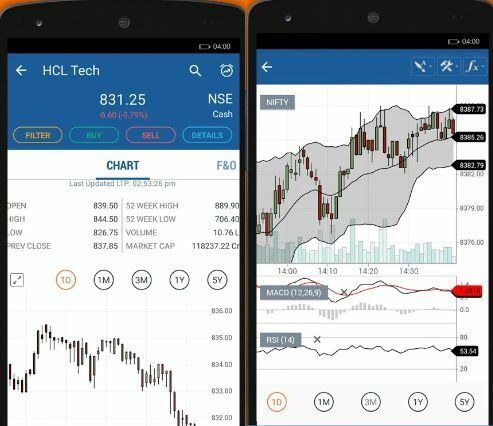 The app also provides live streaming prices, intraday charts with around 40 technical indicators and in-depth reports of Indian and global markets. The portfolio can be personalised according to the trader and a watchlist can be maintained, and the alerts and notifications can be personalised as well. The entire process of trading can be done at the fingertips using the Angel Broking app. Reuters is one of the most dependable commodity trading apps. The characteristic that sets this app apart from all the other apps is the most comprehensive list of commodities. It provides prices not only from the main commodity markets but also from Euronext, TGE and ASXF. However, the Thomson Reuters app also has certain drawbacks. It is less user-friendly and the prices of the commodities are delayed by around 5-10 minutes. The user interface is also a bit complicated, wherein the prices of different commodities and different exchanges are quite mixed up and unclear. The app also does not offer charts. But it is still one of the most extensively used commodity trading apps by the commodity traders because of the most comprehensive coverage of commodities. It is one of the most powerful commodity trading apps which helps to track all the commodities at one place. It is also very comprehensive with quotes from most of the commodities exchanges like NYMEX, CBOT, CME etc. A defining feature of the app is that different commodities are shown in separate sections like Indices, Grain, Energy, Metals etc. and the list of quotes can be formed according to the requirements of the trader. From the customised list of scripts and indices, the trader can view the entire script details like open, close, range etc. for a particular script. The added benefit is the availability of charts with different durations like daily and weekly. The app also provides support for future contracts for different expiry months, for a year. Thus, by making use of the various available commodity trading apps, the traders can trade on the go. They no longer have to sit glued to their systems and almost all actions can be taken from the apps. The information available is very extensive and it is supported by technical analysis tools like charts to help to make the correct entry and exit decisions. The orders can be placed, viewed and squared off using the apps and even the payment transfer between the bank account and commodities trading account is possible at the touch of a finger. In case you are looking to get started with commodity trading or investing in any other segment – just fill in some basic details in the form below. How to Open Commodity Trading Account?